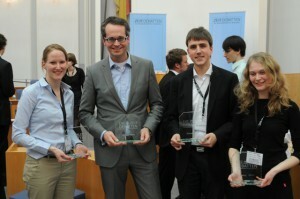 Frankfurter Debattierclub Goethes Faust (DCGF) has elected a new executive board. Andreas Dreher is now president, his deputies are Myriam Tenderra and Marion Seiche. Semi-finalists in Mainz: Heidelberg (607 points) Victoria Reuter, Robin Azinovic and Johannes Sonnenholzner Freiburg (599 points) Zsolt Szilagyi, Johannes Samlenski and Julian von Lautz Frankfurt (571 points) Robert Epple, Andreas Dreher and Paul Utler Mainz (564 points) Jan Papsch, Thore Wojke and Betty Braun To get more information please read the German version! 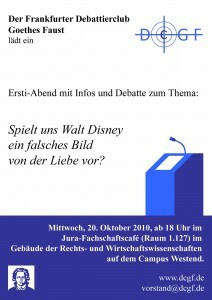 The new executive board of the Debating Society in Frankfurt is composed of Robert Epple and as Vice-Presidents Frank Schneider and Marion Seiche. We are sorry, this article is not available in English. We’re sorry, this article is not or not yet available in English. Please read the German version.